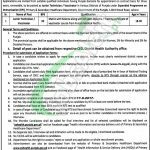 Get Primary and Secondary Healthcare Department Punjab Jobs for Jr Technician Vaccinator 2017 NTS Online Form. Reputed Government Department working under Government of Punjab is seeking to appoint the well energetic, dynamic, hard working and expert applicants with minimum qualification and minimum expertise for the following positions announced in Various Districts of Punjab under " Expanded Program on Immunization (EPI)" for the post of Junior Technician / Vaccinator. Healthcare department invites such candidates possessing Matric in Science along with relevant 2 years Diploma/ Training Certificate of Vaccinator Course approved from Punjab Medical Facility. This vacancy is vacant district wise in the number of the districts of Punjab and the quota is also reserved for Women 15%, 5% for Minorities and 3% for Disabled persons. The appointment will be done on contract basis for the period of 3 years on the Contract Policy of 2004. Age limit should be 18-30 years and 5 years age relaxation will be given to the males, 8 years will be given to the females and 10 years relaxation will be admissible to the Disabled persons. So, let's move on towards its applying criteria below. For all those applicants who want to apply have to simply download the application form along with deposit slip from the NTS Site www.nts.org.pk or from the given link below. Candidates have to the pay the Test fee of Rs. 500/- in the online branches of the UBL, MCB, ABL & Meezan Bank respectively. Duly filled application form along with paid deposit slip, a copy of CNIC and 2 recent passport size photographs should reach the following address given below. The last date for submission of application is September 11, 2017. The date of test will be communicated through the NTS Site to the applicants. Candidates are requested to visit the NTS Site after because the test details will be dispatched one week before the test. Candidates are advised to bring the original documents along with one set of attested copies of relevant documents at the time of interview. So, stay in connection with this page to have more and more jobs. Last Date For Apply: September 11, 2017.